With five Memorial Cups and an OHL record 13 Robertson Cup titles to their name, the Oshawa Generals have treated fans in Canada’s Motor City to a great deal of success over the franchise’s storied history. Some of the game’s greatest names in Bobby Orr, Eric Lindros and John Tavares have come through Oshawa, serving as inspiration for the Generals of today who count it a great responsibility to maintain a winning culture for the years to come. Three Generals including captain Jack Studnicka, winger Serron Noel and defenceman Giovanni Vallati will play under coaches Greg Walters, Nathan McIver and Greg Nemisz for Team OHL tonight as the CHL carries a 6-3 lead in points into Game 4 at the Tribute Communities Centre. “Being a General really is something to be proud of,” said Studnicka, a fourth-year veteran who was a second round pick of the Boston Bruins in 2017. “It’s inspiring to think that we’re in the same shoes that guys like Tavares and Lindros were at one point. Studnicka witnessed the club’s most recent Memorial Cup title in 2015, one that came just months after he was selected in the first round of the 2015 OHL Priority Selection. After a rebuilding season during his rookie campaign in 2015-16, the club won 40 and 36 games in the two seasons that followed. Studnicka and the Generals had to overcome adversity last season when head coach Bob Jones was sidelined with health complications for much of the year. Jones, who overcame life-threatening circumstances, took a job as an assistant coach with the AHL’s Texas Stars to begin this season, opening the door for former Georgetown Raiders Jr. A head coach Greg Walters to take the reins in Oshawa. The team is off to a 10-7-2-0 start, sitting second in the East Division behind the red hot Ottawa 67’s who they defeated in overtime at home on Friday. Florida Panthers prospect Serron Noel leads the team offensively with 12 goals, nine assists and 21 points over 19 games. The 6-foot-5, 212Ib. winger was a second round pick this past summer. An extension to Studnicka’s treatise of the club’s extensive past, Noel had his own encounter with Generals history just last week. The Generals go to great lengths to recognize their past, with historic images throughout the main concourse at the Tribute Communities Centre. The club has retired a total of six jerseys including Bobby Orr (2), Red Tilson (9), Eric Lindros (88), John Tavares (91) and most recently Marc Savard (27) and Tony Tanti (22). Vallati rounds out the Oshawa trio competing in tonight’s game. The Ottawa, Ont. native was acquired from the Kitchener Rangers this past August and joins fellow Winnipeg Jets fifth round pick Declan Chisholm (Peterborough Petes) on the Team OHL blue line. 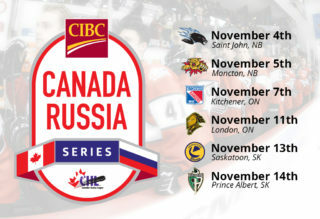 The CIBC Canada Russia Series returns to Oshawa for the third time following past contests in 2006 and 2013. Team OHL claimed a 4-3 victory behind a Bryan Little (Barrie Colts) game winner back in 2006. Russia won the latest encounter 5-2 as defenceman Nikita Zadorov (London Knights) picked up three assists. The CHL carries a 6-3 lead in points into Game 4, one that can be seen live across the country on Sportsnet and streaming live online at CHLLIVE.com.